In the fall of 2017, we introduced an opportunity for our military and military spouse members to receive our New Member Welcome Kit free of charge. To date, over 800 have been shipped to 27 different states. Now, we are excited to introduce the Victory Kit. The Victory Kit is earned and represents the core reason Mission43 exists; education and employment. It is sent as a thank you and congratulations to those members who have accomplished one of two things. The first way a member can earn the Victory Kit is by working with a personal success advisor at Guild Education and going back to school at one of our partner universities. This individual has decided to make a better version of themself and become more valuable in their profession. We believe in the motto “education is freedom” and with hundreds of degree options, incredible education benefits earned through military service, and Guild’s very personalized advising; along every step from enrollment through graduation there is nothing but opportunity for those who want to take it. So we are honored to be able to give the Victory Kit to all those headed back to school. The second way a member can earn a Victory Kit is by finding their next career using the services of Hire Heroes USA. By far, we have seen that finding quality employment is the top concern for transitioning military and their spouses, and we believe this is one of the most crucial aspects to thriving in life after the military. The members who have done this are finding quality employment, not just low-level positions to fill the gap. Their average starting salary has been above $50,000 in Idaho for over 24 months, and career positions have spanned over 20 different employment sectors. This is exciting to us because this means very talented leaders with military backgrounds are spreading throughout the state, and we believe this has a very positive impact on Idaho and our economy. So, those who have used the tools and proven techniques of Hire Heroes USA to find their next career also earn the Mission43 Victory Kit. Keep your eye out for the folks carrying a Mission43 backpack and ask to hear their story. They have earned it by seizing the opportunity to succeed after the military. If you are one of those individuals then we want to say thank you and congratulations...best of luck in your future endeavors! At the end of 2017, Mission43 was still less than two years old as an organization. However, we didn’t let our age get in the way of making things happen through our pillars of education, employment, purpose, and connection. By creating quality opportunities in these areas and bringing forward the attributes of veterans and military spouses, we can make Idaho communities a stronger place. Each pillar organization brought solid leadership to the table with a similar mindset that veterans are not victims. This fresh perspective from those on the team who are currently serving military, recently transitioned, and military spouses, permeated through the opportunities we created throughout the year. We met incredible people along the way who have inspired us and we are proud to now call friends. Guild Education has maintained an 87% retention rate for those enrolled in one of their five partner universities. Hire Heroes USA has empowered over 250 veterans and military spouses in finding their next career in Idaho at an average starting salary of $52,000. Team Rubicon’s membership base in Idaho grew by over 200 new members for a total of 450 throughout the state. 43INC, the new connection pillar, was established and created monthly networking opportunities. We conducted 47 events that included trainings, employment workshops, networking, and fitness opportunities. The Welcome Kits started shipping to those who took our new member survey, getting quality Mission43 gear into the hands of veterans and military spouses. Check out our 2017 highlight video to see what all this looks like in action. We appreciate the support of all those involved and couldn’t be more thankful to have the opportunity to meet incredible people along the way. Looking forward to 2018 and the years to come! 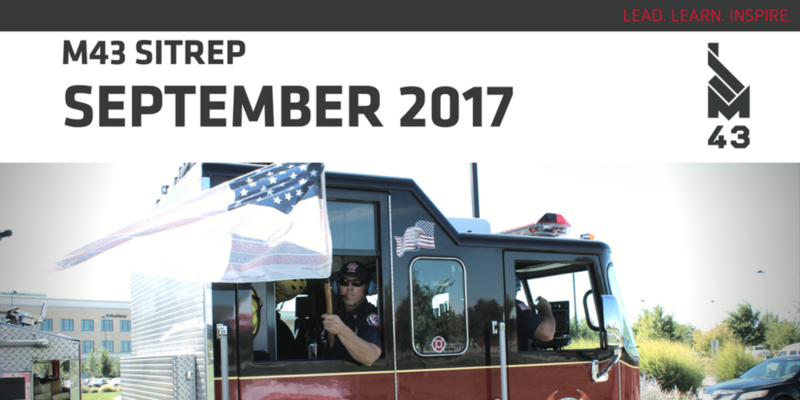 We can sum up September 2017 with the 9.11 Moving Tribute, Team Rubicon Sawyer Training, and lots more quality hires! The team is always ready for a challenge, so we embarked on a pretty ambitious way to honor 9.11. Last year, the Mission43 pillar organizations carried the flag from sunrise to sunset around Kleiner Park in Meridian and we learned the community really saw this as a meaninful tribute. This year we decided to carry the Flag of Honor, bearing the names of all the first responders and civilians who lost their lives in 2001, 40 mile across the Treasure Valley. It brought awareness to a day that many have already forgotten or don’t even know about and we were able to work with 10 first responder departments who helped as escorts. The brainstorming has already begun on how we can make this even bigger next year! Any thoughts? Team Rubicon is already preparing for wild fire mitigation in the spring of 2018. On September 23 and 24th, 10 TR members because qualified Sawyer Level 1 operators. This means they can safely operate chainsaws to cut and clear debris, which will be crucial when they go out to clear the kindling that can create a fire danger near our Idaho communities. Sawyer Level II is coming soon! We also launched our first 3-week Entrepreneur’s Sprint in partnership with the Boise State University Venture College. We have seen more and more demand for this knowledge so we found a way to run a flexible course (after normal work hours), challenging (fast paced and packed with knowledge), and affordable ($48...just enough buy-in that only our serious friends showed up). We had 15 people in the course and it was impressive what was accomplished. New businesses were formed, others refined, and equally important, some folks needed to head back to the drawing board. Keep an eye out for the next one...you don’t want to miss this! As a result of the quality and consistent services provided by Hire Heroes USA, September brought in 16 more hires for people using their services. Each hire represents a leader heading into the Idaho workforce and we are thankful they put their trust in Hire Heroes USA to help them find their next career. Look for more opportunities to attend an in-person workshop! We have a Federal employment focused workshop in October and our first military spouses specific workshop in November. Finally, thanks to Jesse Iwuji, NASCAR K&N pro series driver, who hooked up Mission43 with rides in his modified two-seat car. Five people were selected who have been volunteering or going above and beyond to use Mission43 to create opportunities for themselves. And big thanks to all the volunteers who came out to participate in the Fit One Mission43 water station. By far the best one on the course and only one runner yelled at us. We are pretty sure it was because he didn’t train at all and was suffering by the time he got to us! Thursday, November 21: Mission43 Happy Hour #SIP2GIVE with Telaya WIne Co. 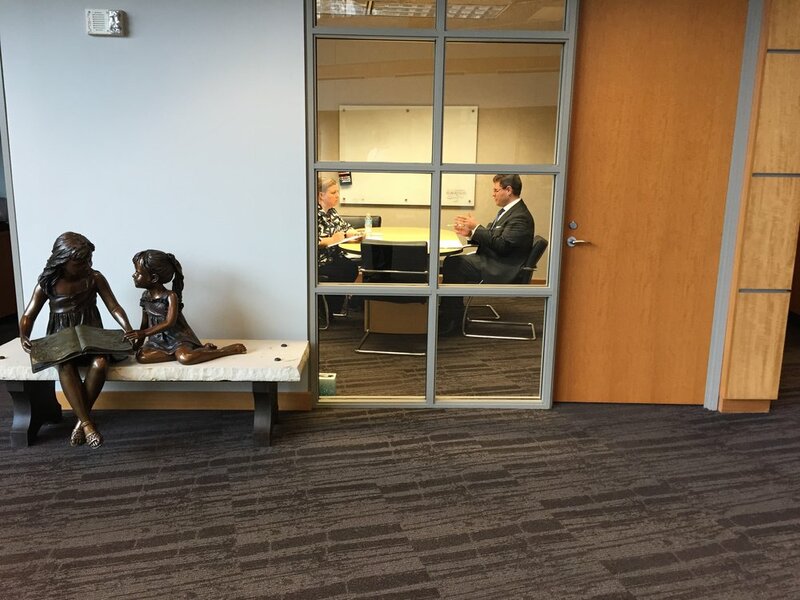 Hire Heroes USA hosted a one-day employment workshop with 20 veterans, transitioning military, and military spouses at the Deloitte offices in downtown Boise. 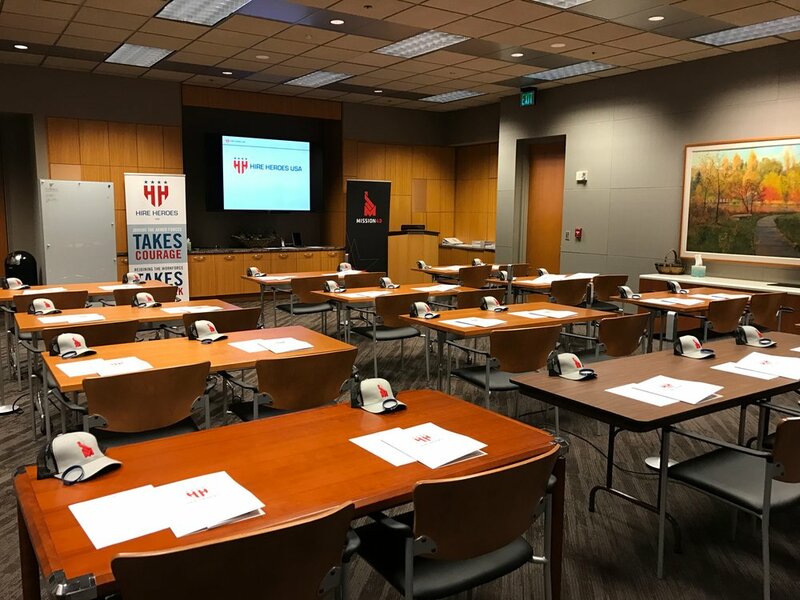 On August 9th, Hire Heroes USA hosted a career day which brought in close to 20 Idaho employers to conduct mock interviews for career-ready candidates. Each participant had the opportunity to do 3 interviews and many have already been confirmed as "hired!" Networking and connecting Mission43 members is something we always like to do. Thanks to our friends at Keller Williams Front Porch Boise who sponsored this month's 43INC Happy Hour at the veteran owned Powderhaus Brewing Company. We had over 50 people come out. Mission43 launched the Project 43 campaign. You may have caught some of the stories on TV or social media that highlight veterans and military spouses transitioning to their "next." Check out this one featuring an NCO who attended the first Hire Heroes USA workshop as he was preparing to leave the military...pretty inspiring! Upcoming: One of the things we have been consistently hearing from people is an interest in entrepreneurship. There are a lot of different programs out there, and we wanted to find an affordable, flexible, and very high-level program for our members. As a result, you will see on September 19th that we kick off our Entrepreneurs Sprint with the Boise State University Venture College. This can be a life changing course and we can't wait to take part in this and see what opportunities develop from it. We are also working on finalizing the venue, logistics, and guest for our next Mission43 INC. We will announce that next week! Check out all the other upcoming events! Over the coming months, Mission43 will be bringing to light a series of stories featuring Idaho veterans and spouses transitioning to ‘their next.’ Their ‘next’ may be a new career they didn't know was possible. Their ‘next’ may be a new community they feel proud to be part of. We will also see stories of employers and community members who have been impacted by those who have worked with Mission43. These are stories of leaders and lifelong learners. Military service, which includes the service of our spouses, is an inspiration for Idaho. Now, with The 43 Project, what most didn't know existed around them will come to light. Get started with Adonis Jones and hear how a little boost from Hire Heroes USA changed his outlook on what was possible. Check out the full line-up of the 43 Project stories on YouTube! Not What You Are Used To. The Hire Heroes USA Workshop and Career Day. A lot of us have been required to attend transition programs run by the DoD (starts with a “T” and ends in “APS”). You may have been to a well-intentioned civilian employer event at your base. However, these experiences have always left us wondering if it was worth our time, and the answer is usually the same. Enter the Hire Heroes USA team. They are not what you are used to. They are a performance-based organization that empowers you (military, veterans, and military spouses) to transition to your next career. Fortunately for us, we have our own Idaho team that works directly with Mission43 to make sure Idaho can be a possibility for military families after their service. The Idaho Hire Heroes USA team just completed back-to-back employment events over two days. The first was a transition workshop, which transforms a candidate into the ‘package deal’ for employers. Attendees built their resumes and LinkedIn profiles, learned how to “dress for success” thanks to Men’s Wearhouse, and developed crucial interviewing “TTPs”...wait no military acronyms when interviewing! It’s tough to replicate the quality and experience behind what is accomplished in a Hire Heroes USA workshop. Special thanks to Deloitte Boise for providing the venue and volunteer support! All this resulted in career ready ready veterans, military spouses, and transitioning military in addition to multiple actual job opportunities. A sample of the companies who participated: HP INC, NY Life, St. Luke’s Health System, St. Alphonsus, Zions Bank, Micron, PacificSource, Albertsons. Expect more of these to come from the Hire Heroes USA team! In the meantime, if you want to start working with your own Transition Specialist join Mission43 and be sure to select Hire Heroes USA on your registration! Education: Guild Education brought another school on board for Mission43. The University of Denver brings the total number of schools we are working with to five. This is important because we are finding more schools that give appropriate academic credit for military service, while expanding the number and types of degrees available. Coupled with Guild Education’s expertise in using your benefits, this is starting to change the standard for our academia friends in supporting military students. Employment: 176 hires in 16 months; average starting salary of $51,000, 94% full-time positions. Think careers, not jobs. The Hire Heroes USA machine is achieving unmatched results in Idaho. Purpose: Team Rubicon conducted another Idaho disaster relief operation, this time supporting flood clean-up as the high waters from winter runoff have receded. TR members removed sand bags and debris, showing service to the community doesn’t end after the military. In addition, Brian Von Herbulis, Idaho’s TR lead and National Wildland Firefighter Coordinator, has facilitated the deployment of over 50 veterans to fires around the country. Connection: Team Red, White & Blue continues to stay active with weekly runs, mountain bike rides, and social events. Chad Rohr, the Boise chapter captain, is now known as the “guy carrying the flag” everywhere he goes! Team RWB also recently hired their Boise-based Program Manager, Cody Sohn. She joins us from Fort Benning, GA and will be re-locating to the area in August. We are excited to have her on the ground and helping to grow chapters around the state! Mid-July also welcomed the 31st Annual Twilight Criterium to Boise, one of the top cycling road races in the country, so we kicked off the event with a Mission43 INC Happy Hour at the veteran-owned Powderhaus Brewery. Our official partner, Team Twenty20, a pro-cycling team with their eyes on the Tokyo 2020 Olympics joined us to hang out and raffle off a ton of prizes from their sponsors. After that, we hosted a VIP tent at the Criterium and watched Team Twenty20 take the win in the women’s pro race. We had a great turnout at both and enjoyed the opportunity to network and connect with Mission43 friends and families! Check out our photos from the event. We have good momentum heading into August. Keep an eye on our events and feel free to join us when the time is right! First off, if you are reading this it is pretty much guaranteed our 43INC guest Brian Stann can beat you up. Why? Well he fought in the UFC. He played football at the United States Naval Academy (although he did lose to Army one of those years...Beat Navy!). He was a USMC infantry officer. He was awarded the Silver Star for his actions leading men through intense combat near Al Qaim, Iraq in 2005. Now, he is the CEO of Hire Heroes USA which to-date has helped over 13,000 veterans and military spouses find employment. Brian Stann clearly has an incredible resume, but he had the same problem a lot of veterans have transitioning out of the military. He tackled this head-on as soon as we got going in this 43INC session. When he left the USMC he made his own resume and it ended up being three pages long. How do you translate military experience for a civilian company? What does leading troops in combat have to do with leading teams outside of the military? This is what Hire Heroes USA does like no other veteran employment organization, and they are a making a huge impact for Mission43 members. Brian’s message was strong. You are the one who is responsible for your transition. You have to choose to live the American dream. And if you do, the entire Hire Heroes USA organization will be behind you to support your transition. 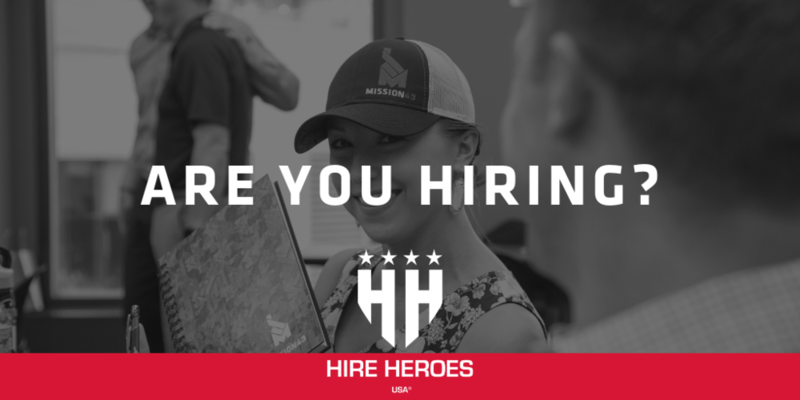 Click to learn more about Hire Heroes USA role in Mission43. February 23, 2017 at the Olympic in Boise, Idaho. 43INC featuring Hire Heroes USA CEO, Brian Stann. Brian is the recipient of the Silver Star for his actions in Iraq, is a former UFC fighter, and UFC commentator for Fox Sports 1. Bryan Madden (M43 Program Director) and Brian Stann (CEO of Hire Heroes USA) sat down with Doug Petcash, host of KTVB's Viewpoint. They talked about the what is happening nationally and at a local level for veterans and military spouses transitioning into civilian life. You can check out that segment here: VIEWPOINT. After the Brian and Bryan show, Sandra Rollings from Team Rubicon talked about what they have been up to, including the recent Operation Payette Forward. Behind the scenes on KTVB with Doug Petcash (left), Bryan Madden (middle), and Brian Stann (right). This was the third and largest Idaho workshop for Hire Heroes USA. Tony Torres, the Idaho Area Manager, hosted 26 veterans and spouses at the J.A. and Kathryn Albertson Family Foundation over two days. Day 1 included classes on interviewing, creating an elevator pitch, finalizing resumes, polishing up the LinkedIn profiles, and Dress for Success. Day 2 brought everything together when attendees did mock interviews one-on-one and in panel format. As usual, some of these interviews may have led to actual job offers. The feedback was overwhelmingly positive and demand will only continue to increase as word of mouth starts to spread what Hire Heroes USA is doing here in Idaho. Men's Warehouse provided the Dress for Success class. Gretchen Lemay Photography provided stunning professional head shots for the LinkedIn profiles. HP INC came out in force and conducted panel mock interviews. Pacific Source provided one-on-one mock interviews. The veterans, spouses, volunteers, and Hire Heroes USA staff. Well done! One on one mock interviews. Mission43 was honored to host the kick-off reception for The Adjutant General’s Leadership Day. (The “TAG” is the Major General, or two-star, in command of a state’s National Guard). We hung out in the Telaya Winery production area and were joined by Butch Whiting, CEO and co-founder of Kryptek Outdoor Group. Brian Von Herbulis, the 43INC man-in-charge, and Butch have both successfully commanded in combat and gave a great perspective on leadership. And the Telaya wine was as good as it gets! Idaho National Guard Reception in the Telaya Winery "Production Room"
One flag, constantly moving from sunrise to sunset. That is how the Mission43 team honored this day. Firemen, police, the Idaho National Guard, families...over 200 came to Kleiner Park to help keep the flag in motion. For the 30 days leading up to 9/11, we posted a new video each day of people with all different backgrounds telling their story of where they were on September 11th, 2001. Our lives all changed from deploying, to losing friends, to new security measures in the way we go about business. We all remember that moment though and we thought a great way to reflect and remember was through this moving tribute. As a new organization, we are working hard to get our name out on the street and we thought a fun way to do this would be to participate in the Boise 4th of July Parade. We have to confess we aren't normally parade people, but you can't help but enjoy seeing the thousands of patriotic people lining through streets all enjoying the morning with their family. Members of Team RWB came out strong living up to their mission of connecting veterans to their community through physical and social activity. Good times and Happy 4th! Scotty Smiley, author of Hope Unseen. Mission43 officially kicked off at Boise State University's Stueckle Sky Center on March 15, 2016. The room was packed with leaders from the community, currently serving military members from the Idaho National Guard and Mountain Home Air Force Base, military spouses, and veterans who came to hear about this different approach to supporting transitioning military families. Scotty Smiley gave the keynote address. He was blinded by a vehicle born IED in 2005, but went on to graduate from Duke with his MBA, became the first active duty blind company commander, climbed Mount Rainier, and authored the book Hope Unseen to tell his story of never giving up. Jake Wood, CEO and co-founder of Team Rubicon, talked about what it takes to be a TR member and the reason why so many of us are ready to answer the call when our communities need disaster response support. Blayne Smith, Executive Director of Team Red, White & Blue talked about the eagles ethos and the importance of enriching the lives of America's veterans through physical and social activity. Finally, Brian Stann addressed the crowd via video and talked about the Hire Heroes USA team behind each veteran and military spouse who are there every step of the way in the search for their next career. March 15, 2016 at Boise State University's Stueckle Sky Center. The official launch of Mission43 with Hire Heroes USA, Team Rubicon, and Team Red, White, & Blue.